Let this be the dish that converts you to cooking whole fish, which may require a trip to the fishmonger’s or seafood market. From “Deep Run Roots: Stories and Recipes from My Corner of the South,” by Vivian Howard (Little Brown, 2016). This recipe is featured in Chasing Trout in Season 5 of A Chef's Life. Preheat oven to 325 degrees. In a 12inch cast iron skillet, heat 1 tablespoon olive oil over medium high heat. Once it’s shimmering, add 2 trout and brown them on both sides. If your pan is nice and hot, it should take about 3 minutes per side. Transfer them to a baking sheet. Add remaining oil and brown the remaining trout. 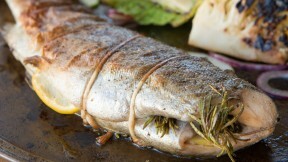 Slide all four trout onto the middle rack of your oven and roast for 15 minutes. Serve warm with the apple mustard and slaw. Remove the sachet and transfer the contents of the pot to a blender and blend till totally smooth. Put the apple butter back in the Dutch oven and cook uncovered on low heat another 20 minutes. Adjust the seasoning with salt or brown sugar to your liking.